“Change or be changed”: that was the message from International Olympic Committee President, Thomas Bach, during his opening address at the recent SportAccord Convention 2016 held in the Olympic Capital, Lausanne. President Bach’s statement reflected the core message behind Olympic Agenda 2020 which has set the direction for the future of the Olympic Movement, particularly in the areas of ‘sustainability’, ‘credibility’ and ‘youth’. Not surprising, therefore, that these three themes were at the core of many of the discussions held throughout the week-long gathering of international sports leaders. 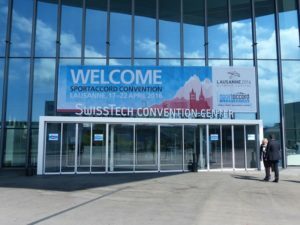 With over 40 active and engaged hosts represented at SportAccord Convention 2016, Schwery Consulting took the opportunity to speak one-on-one with multiple city and country representatives to gauge their views on sustainable event management as it relates to international sports events. When asked where the responsibility lies in ensuring an international event is hosted in a sustainable way, generally event hosts believe that sustainable event management is a joint responsibility between the host and the international federation. However, most interviewees felt that in general the hosts have traditionally taken on the majority of the responsibility thus far but are hoping that international federations, being encouraged through Olympic Agenda 2020, will start to be more proactive. Three areas in particular were highlighted in the interviews: strategy, consistency and support. It was clear that the event hosts interviewed were knowledgeable about sustainability: most of their sport event strategies either highlighted sustainability as a key pillar or had it as an integrated theme throughout. Generally, the implementation of sustainability initiatives was being driven from a local perspective; either due to government policies, or legislature, or because of partners such as venue owners, accommodation providers, transportation companies and major sponsors insisting upon their integration. Interviewed event hosts felt that they seldom received much direction from the international federations themselves. This is an area that many interviewees hoped would change and federations would start to identify and communicate what the priorities are for the sustainability of their events. It was felt that, with clearer strategies in place from the beginning, the international federation and the host could set common priorities from the beginning and be more effective in working together to make positive impacts. London 2012 was a catalyst for the development of international standards in sustainable event management (ISO 20121:2012 Event sustainability management systems) and sustainability reporting (GRI G4 Event Organizers Sector Disclosures). Since their creation, event organisers, venue owners and other event stakeholders have started to use these standards worldwide to varying degrees. The interviewed event hosts feel that international federations should be using these standards to create consistency throughout the industry; consistency in terminology (how is sustainability defined by the international sports world – for hosts it is clear that it reaches across environmental, social and economic impacts) as well as consistency in monitoring and reporting of initiatives. The more consistency the easier it becomes for hosts, no matter where they are in the world, to ensure that high standards are being met and the impact from each edition of the event is being fully recorded and communicated. Event hosts noted that in the bidding phase they are often asked to come up with concepts surrounding sustainability, and they support this practice as it encourages new ideas. But it would also be useful for federations to come with initiatives that have been tested and shown to improve the event management and even create cost savings for the hosts. Many event hosts highlighted that what they do not want is for international federations to show up with a long list of demands or requirements when it comes to sustainable event management practices that will cost the host money to implement, but that they would like to have insight on what past event hosts have done that have been effective. At the moment, the event hosts stated that they are learning from their local partners and from other hosts how they can improve the sustainable management of their events, but they are not seeing expertise, support or leadership coming from most of the international federations. They also feel they are not seeing enough sharing of good practices between sports. There are so many initiatives that could be implemented at all international sports events but this information simply is not being shared between the federations themselves. It’s clear that sustainability is a key focus for hosts, and with the creation of international standards and an increase in requirements from governments in general, more pressure will inevitably be put on event hosts. However, encouraged by the focus on Olympic Agenda 2020, the event hosts we interviewed at SportAccord 2016 were optimistic that international federations will take a greater share of the responsibility. We look forward to what lies ahead!